Originally introduced to the province in 1958, the wild turkey has evolved into a highly desired game species that has been successfully established throughout southern Manitoba. Growing populations and dedicated conservation projects have heightened the stature of our wild turkeys, which have naturally progressed into an inspiring success story and an adored challenge by hunters of all ages. Manitoba is home to both the Eastern and Merriam’s sub-species, offering an exceptional choice for a multi-species turkey experience. Hunting opportunities for wild turkey are only available to Manitoba Residents. Enticing a gobbler into close range is an amplified encounter. It often results in a thrilling sequence of intense calling, stunning exhibitions of blooming feathers and boastful struts. It’s an exhilarating match of wits and seduction, demanding a firm commitment to the art of concealment and a genuine ability to deliver convincing harmonies of yelps, clucks and purrs. The unmistakable response and prudent advance of an insistent long-beard is the pinnacle moment for any ardent Turkey hunter. It reveals an invigorating experience that is truly incomparable. The wild turkey is a wise bird with an acute sense of sight and hearing that seldom offers any room for error. They are always on top of their game! Wild Turkey hunts are popular in areas of the Western, Central Plains Pembina and Eastern Region. Hunting season dates are during the months of April, May and October. 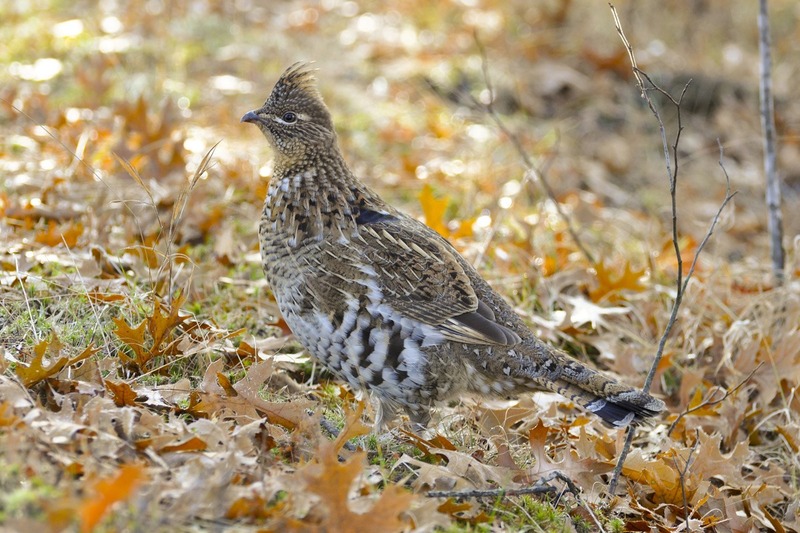 From the fence rows of our southern prairies to the dense mixed forests of our northern terrains, Manitoba is home to a variety of sought after grouse species and traditional grouse hunting experiences. Whether you choose to walk endless miles of woodland trails for ruffed or spruce grouse or stroll through limitless tracts of pasture and crop land for sharp-tails, the opportunities throughout our provincial regions are boundless and highly favoured by many upland enthusiasts. Wandering along a winding trail, only to be startled by an explosion of feathers flushing from overlooked cover, is a thrilling encounter that grouse hunters so often pursue. It’s an experience unique to a distinctive season and one that is often complimented by a longstanding tradition. It’s an engaging chase for a sporting legend, an expert of concealment and evasion. It’s a bird that commands a constant effort and a persistent search that’s often measured in miles. The grouse will always keep you on edge! Grouse hunts are popular in areas of the Northern, Parkland, Western, Interlake, Central Plains Pembina and Eastern Region. Hunting season dates are during the months of September through December. Originally introduced to the province in the early 1900’s, the Gray (Hungarian) Partridge has become a well-established entity throughout the agriculture areas of Manitoba’s southern regions. A highly adaptive species, it is often found within close proximity of competing grouse populations and regularly inhabits open grain fields, grasslands and prairie brush rows. This hearty little game bird is also the topic of a successful induction and the deserving recipient of a unique wing shooting experience. Combing through the stretches of infinite stubble fields, your attention is drawn to a covey of scattering Huns, swiftly avoiding your forward advance. While hurrying your step to improve your position, a holding bird captures your interest. Standing motionless, your focus remains on an idle object only yards to your front. Patience rules the oncoming moments. You inch forward, at the ready, to provoke a reaction. The threshold is met, an escape is matched with a flawless lead, your hard efforts are instantly rewarded! Partridge hunts are popular in areas of the Western and Central Plains Pembina Region. Hunting season dates are during the months of September through December. For those that have had the privilege to pursue them, the ptarmigan presents one of the most classic wings hooting experiences available. Native to the remote habitats of Manitoba’s northern region, this upland icon occupies remarkable landscapes that stretch from secluded areas of the boreal forest to the far reaches of the barren grounds. This aesthetically impressive game bird can be frequently found in favourable numbers, providing exceptional hunting opportunities that may only be restricted by limited access. Probing the edges of willow-choked shorelines, you meticulously survey the low lying brush. Your ears become engaged to a sequence of gargles that steadily fade into the immediate distance. Your eyes hone in to multi-colored plumage, warily manoeuvering through a maze of branches. An urgent stride stalls its progress, as you promptly prepare for an imminent flush. A flurry of wings burst through the cover, as a surprising covey glides above the tundra. You instantly point, your aim holds true, your adventure is complete! Ptarmigan hunts are exclusive to areas in the Northern Region. Hunting season dates are during the months of September through February. For more information on Game Bird Hunting Zones (GBHZ’s), season dates, resident, non-resident & foreign resident Game Bird hunting licenses or additional information on hunting in Manitoba, please visit the Manitoba Conservation website or refer to the current Manitoba Hunting Guide.